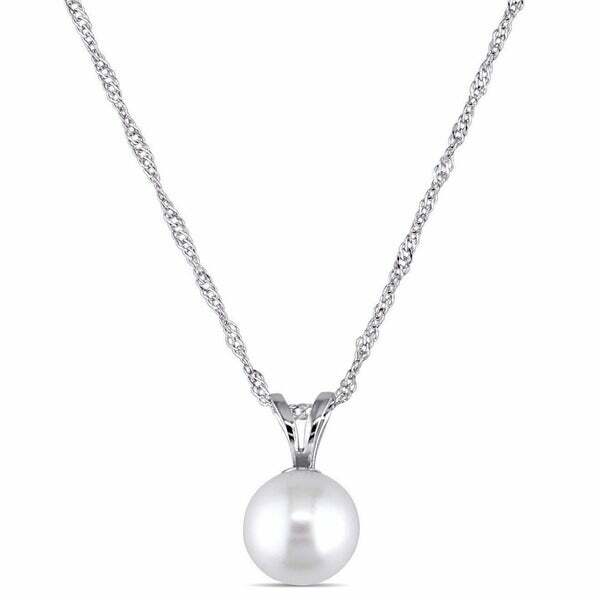 Very nice pearl drop necklace with white gold chain. Perfect for my granddaughter's graduation. Chain is not too lightweight so she should have good usage of this. DaVonna 14k White Gold White Round Freshwater Pearl Necklace Chain Pendant 18"
DaVonna 14k Gold Necklace with White Freshwater Floating Pearl Jewelry Necklace, 18"
This stunning Miadora drop necklace is crafted in 14-karat white gold and features a graceful cultured freshwater pearl suspended on a lightweight Singapore chain. This timeless classic is the perfect versatile piece to wear on any occasion. All carat weights and measurements are approximate and may vary slightly from the listed dimensions. Treatment code N (white pearl). See Treatment Guide for further information. Best pearl I could fine! I needed the pearl necklace before my wedding. Triple A quality and price of the necklace, sure made my budget. My bridesmaid loved the pearl. They were extremely happy with their pearl necklaces. Purchased this as a gift for my girlfriend. She absolutely loves it, and wears it most days. The chain and the pendant have held up beautifully over about six months, although the chain is a magnet for loose hairs and does get entangled pretty easily. The clasp is also tricky to operate and requires a delicate touch, though she got the hang of it quickly. Very happy with the purchase. This is a beautiful nevklace. The chain is 16 inches and was too short for me. The chain glistens like diamonds and the pearl was a good size. I bought this as a graduation present for my daughter. She loved it! The length was perfect for her and looks very delicate and feminine around her neck. This is a very pretty necklace. Purchased this pearl necklace for my granddaughter's 16th birthday. She loved it. The pearl was perfect. The chain, while probably fine for younger people with good eyes and small hands, was impossible for my wife to open and close. The catch assembly was too small for her. The chain itself was a very thin strand, but was very pretty. I purchased as a Christmas gift. I received it over the weekend which was quicker than I expected. I am very happy with this purchase. It is absolutely beautiful! I can’t wait to give it to my daughter! Out of the 3 jewelry items I ordered, this is the only one I received that resembles what I ordered. Very lovely and delicate just needed a longer chain . I love it! I get a lot of compliments on it. My wife loved it! She wears it all the time. "can you get this in a 17' chain"
This has a 17 inches chain. "Is there a pearl pendant on a silver chain that is 24 inches? I'm looking for something in the $75 range." The Miadora 14k Gold Pendant is* today and is on a 17" chain. It is very feminine and a good value for 14k.